When was the last time you ordered an Absolut Cosmopolitan and a Grey Goose Cosmopolitan at the same time and tried them side by side? Probably never! So how do you know which one is best? In this workshop you will start by learning the attributes of five different Vodkas, from different regions of the world, each produced from a different raw ingredient. 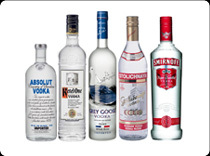 Vodka is traditionally a tasteless and odourless spirit. You are about to learn that it is anything but tasteless and has amazing aroma. When you learn the flavour notes you discover the hidden pairing techniques and skills that master mixologists use to make bestselling cocktails. You'll learn why a brand might work well in one cocktail but not another. 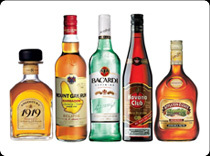 Rum is a complex spirit that comes in many forms from light and dark to spiced and aged rum. Lots of bartenders pour rum, but few know the key differences between the brands that they are pouring. In this workshop you will learn five rums and discover what makes Bacardi different from Captain Morgan and many others. When you have identified your favourite you will design cocktails with each of the five rums and discover which brand of rum makes the best Mojito or Daquiri, giving you knowledge that few people ever have the opportunity to master. With this knowledge you will have the skills to give your guests an experience that they will never forget. 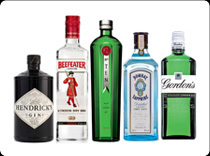 Many people look at Gin as an older person’s drink and many of us have had a bad experience with gin in the past... a "Gincedent" if you will. Gin is now one of the fastest growing spirits, and knowing which gin works best in a cocktail is a powerful weapon in your bartending arsenal. In this workshop you will discover and learn about five Gins, learning about the Infusion process and botanicals that make each Gin unique. After you have identified your favourite, you design a cocktail based on the type of Tonic you prefer! This mastery workshop will give you the skills to create the right gin cocktail for the right guest, and will give you the confidence to speak intelligently about a wide variety of gins. The world of Molecular Mixology is intimidating, this workshop teaches you that it's not as difficult as many people say. You will learn how to make mouthwatering foams to top high end cocktails, and how to use mists to change and improve the flavour of cocktails. You will learn to Flambe glassware and Brulee cocktails to give your guests an unparalleled experience that they simply won’t find anywhere else. With these techniques mastered, you'll learn to "Fatwash" spirits to make infusions like "Bacon Infused Vodka" and use core infusion techniques to flavour your own spirits and make custom cocktail ingredients that will set you apart from every other bartender serving today! Whiskey can be intimidating at the best of times, but this workshop will prepare you to speak about whiskies from different regions of the world, and understand why some work well in cocktail applications and others are best enjoyed on their own. 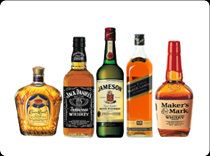 In this mastery workshop, you will discover blended whiskies from Ireland, Scotland, Japan, India, Canada, and America. Once you have identified your favourite you will make whiskey cocktails with each spirit and discover which whiskey works best in each cocktail application. Your guests will appreciate your level of knowledge and comfort and come back to you again and again for your expertise. Discover the differences between different brands of Tequila, and what makes 100% pure agave tequilas different from Mixto Tequilas that are commonly found in the speed rails on most bars. From Silver, to Gold Tequilas, and Rested to Aged Tequilas, this workshop will show you why tequila is one of the most rapidly growing spirits. 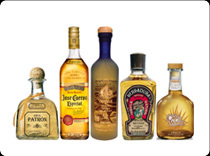 You will design cocktails with each brand in mind to discover which tequila works best in each cocktail. This workshop will open your eyes to the world of agave spirits so you can make recommendations to your guests that enhance their experience and your tip average! Class Seven – Master of Brandy and Cognac. Brandy as a word is derived from the Dutch brandewijn or "burnt wine" and is literally a spirit produced by distilling wine. 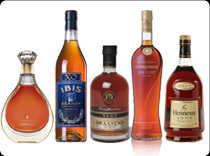 Both Brandy and Cognac are often interpreted as an older person's drink, something to sip and enjoy with a cigar. While Brandy and Cognac are truly spectacular on their own, they also make up the backbone of some phenomenal contemporary cocktails, and as the Brandy and Cognac category continues to grow and expand, a fundamental knowledge of these products and what differentiates different distilleries, and designations is a core skill that great bar chefs must possess. You will discover that both Brandy and Cognac are complex spirits, that make delicious cocktails! 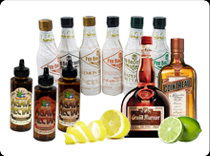 Class Eight – Mastering Bitters, Sweeteners, Citrus, and Modifying Liqueurs. Possibly the most intense workshop of all, you will learn the basics of infusion and fortification to make complex flavoured syrups that can be fortified with your choice of spirit. Taste more than 40 modifying sweeteners, citrus, and bitters. In this workshop you'll have a solid understanding of the difference in taste between different types of citrus, and when to use sweeteners like agave nectar, maple syrup or cane syrup in a cocktail. You'll learn which cream liqueurs, orange liqueurs and a host of fruit flavoured liqueurs are used to modify the flavour of a base spirit in hand crafted cocktail creation. With a thorough understanding of sweet and sour flavour profiles, you'll then learn to use both house made and store bought bitters from Angostura, to Fee Brothers, to the Bitter Truth, regarded by many as the finest bitters on the planet. Building on the Infusion, Foaming and Misting Skills that you learned in Mastering Molecular Mixology 1, you will learn how to make "Cocktail Caviar" through a unique process called "Sperification." 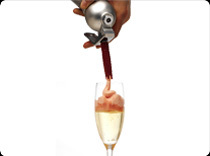 Using the techniques you will learn in this class, you will be able to convert almost any cocktail into a "Caviar" style cocktail which can be served on a wonton spoon and eaten. Along with a host of other eye popping cocktails using molecular techniques. Once you understand "Spherification," you will learn "Reverse Spherification" where you will be able to create "Cocktail Ravioli." 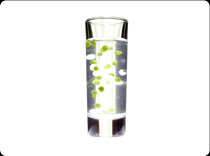 While Molecular Mixology will never replace traditional mixology, it is a fantastic way to set yourself apart from traditional bartenders who simply pour drinks! 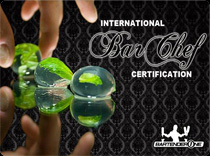 Your IBC final exam will be your first mixology competition! Utilizing your new found skill sets, you will be challenged to create a unique cocktail and present a menu for each spirit including Vodka, Whiskey, Rum, Gin, Brandy and Tequila. 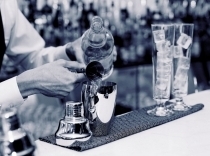 Your menu will be judged by three of the top mixologists in the city. This is your time to shine! Experiment, be original, and be creative!